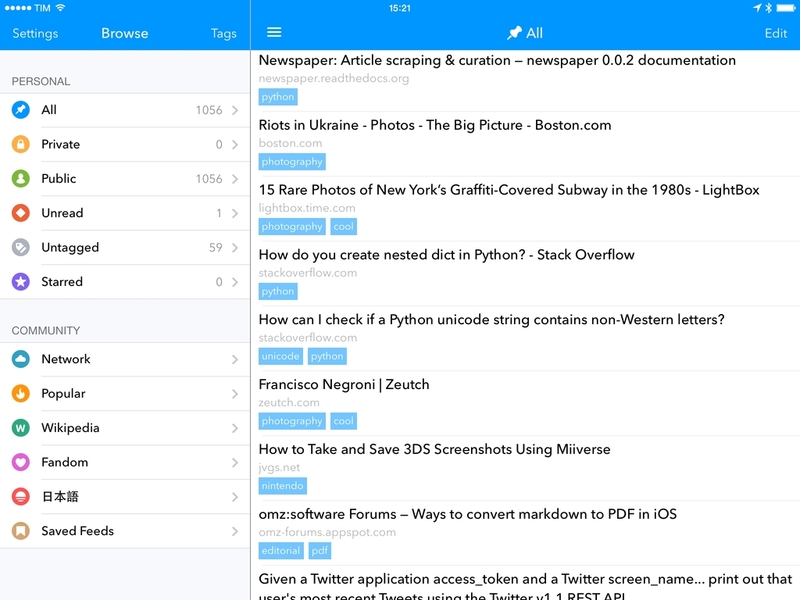 Developed by Sam Oakley, Pinner is a great example of the reinvention that iOS 8 is bringing to third-party apps. Developed by Damien DeVille, Spillo is a new Pinboard client released today for OS X and available on both the Mac App Store and Bananafish Software’s website. Unlike Shiori (a desktop app for Pinboard I covered before) and other minimal apps that try to facilitate the process of saving bookmarks to the service, Spillo wants to be a full client for management and discovery of links, and it’s reminiscent of powerful solutions for iOS such as Pushpin and Pinswift. I’ve been using Spillo for the past couple of weeks, and I think it has potential. Perspective does not make you immune to burnout. It just makes burnout less scary. I've gone through a few episodes since starting Pinboard, and I'm sure there will be more to come. People have been very understanding about my occasional need to flee the Internet. I find that the longer I run the site, the more resistant I become to the idea of ever giving it up, even if I need to take the occasional break. It is pleasant to work on something that people draw benefit from. It is especially pleasant to work on something lasting. And I enjoy the looking-glass aspect of our industry, where running a mildly profitable small business makes me a crazy maverick not afraid to break all the rules. A great post on Pinboard's fifth birthday by Maciej Cegłowski. Pinboard is one of my favorite web services because it does its job well and it's dependable. There's a lot to learn from Maciej when it comes to building trust and a profitable business on the Internet. For the past year, I’ve been asked on multiple occasions by MacStories readers about Pinboard, and I thought it’d be fun to address that question with a detailed explanation of my usage of the service. I love Pinboard. I realize that it may be somewhat strange to share such feelings for a web service, therefore allow me to rephrase it: I love what Pinboard’s creator Maciej Cegłowski has been doing with the service and I love Pinboard’s focus and direction. Pinboard is a bookmaking service purposefully devoid of complicated social features and primarily aimed at personal bookmarks. If you’ve been on the Internet for a few years, you may be familiar with Pinboard as the straightforward alternative to Delicious from the days when Delicious used to be a bookmarking service, and that still holds true. 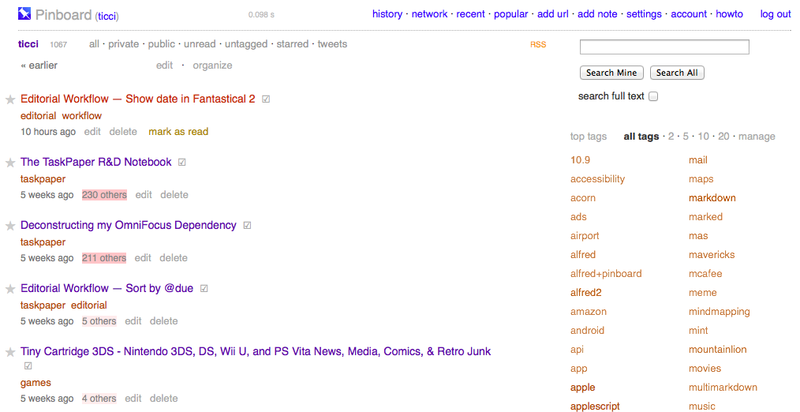 Fundamentally, Pinboard is a service to save links. In spite of its simplicity and barebones presentation, Pinboard is packed with clever options and settings that you can use to tailor the experience to your needs. There are compatible apps (Pinboard has an API), bookmarklets, RSS feeds, and many other tricks and hidden tips that can considerably improve your usage of Pinboard, and I’m going to cover those, alongside some personal suggestions, in this post. Pushpin, a powerful Pinboard client that was recently updated to version 3.0, got its first major update to 3.1 today, which introduces more advanced functionalities to get the most out of Pinboard navigation, feeds, and saved searches. For keyboard users, a big change is the addition of keyboard shortcuts to the app. As documented on Lionheart Software's website, it's now possible to scroll through bookmarks, open the editing view, toggle statuses, and select fields using an external keyboard. This makes Pushpin one of the most versatile iOS 7 apps with keyboard integration. In my previous coverage of Pushpin, I noted the lack of customization for feeds and sections in the app's sidebar, which forced me to keep certain items I wasn't interested in – such as Pinboard's Wikipedia and Fandom sections – always visible. In Pushpin 3.1, feeds on the main screen can be hidden and reordered; in combination with custom feeds for tags and users, Pushpin now has the most flexible main screen for users who want to tailor the Pinboard navigation experience to their needs – a solid enhancement if you use Pinboard as a news source more than a simple bookmark aggregator. In this version, Pinboard Notes make a comeback (although they're still read-only due to a limitation of the Pinboard API) and there's a new Recent feed to view all recent bookmarks from all Pinboard users. For power users, an advanced search feature has been added, which can look for bookmarks that match specific criteria in a Pinboard account. Based off the SQLite FTS technology, advanced searches can be created with filters for URLs, titles, tags, and a combination (or exclusion) or multiple ones at once, opening up several options for searches that filter down specific results. The special syntax for advanced searches is limited to bookmarks for a configured account, which caused some confusion when I first tried the feature (it doesn't work with Pinboard's web search for public bookmarks). With today's update, Pushpin has become the fastest, most customizable, and most powerful Pinboard client on my devices. With feed reordering and keyboard shortcuts, I can now navigate Pinboard with ease on my iPad, removing feeds that I don't need; overall, Pushpin has evolved into a fantastic, feature-packed Pinboard client with a clean interface and tons of options. Pushpin 3.1 is available on the App Store. 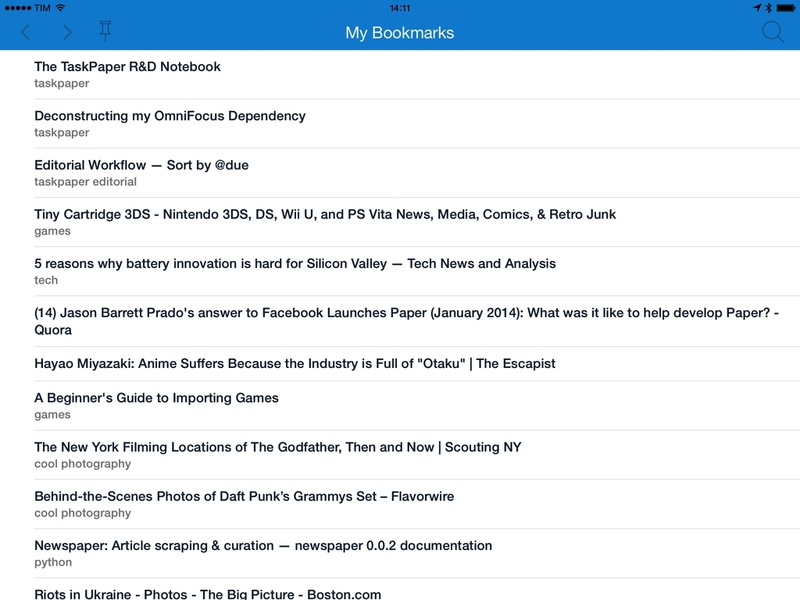 Pinswift, a simple but powerful Pinboard client for iPhone that I reviewed in December, has today been updated to version 1.1, which introduces iPad support as a Universal app. Pushpin, a full-featured Pinboard client that used to be my personal favorite before iOS 7, has today been updated to version 3.0, which brings a new design, a split pane interface on the iPad, and several other features. On the iPhone, I now prefer Pinswift, but Pushpin remains the best Pinboard experience for the iPad, which is where I spend most of my time bookmarking links and discovering new ones every day. 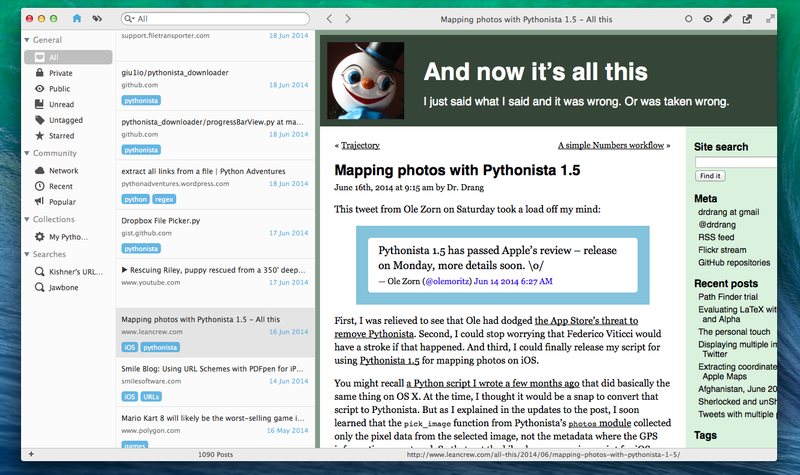 Shiori is a nice new Pinboard client for Mac that lets you find and add bookmarks. The app can be configured to have two separate keyboard shortcuts for adding and finding items; alternatively, you can click on the app's icon in the menubar and work with the dropdown menu (which also contains shortcuts for Refresh and Preferences). The interface is clean and minimal, with tags highlighted in light blue/green; Shiori comes in the foreground with a list of the latest 7 bookmarks from your account (by default; you can show up to 10) and you can start typing to filter results. 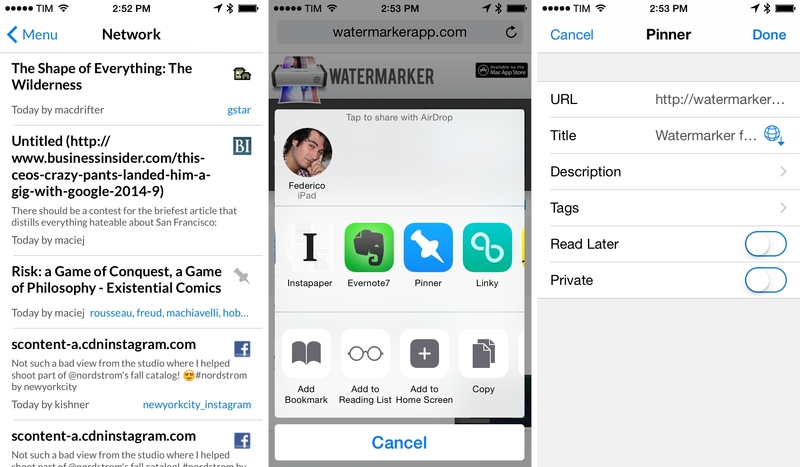 The app is extremely fast at retrieving items, and it supports abbreviations to look into bookmark titles, URLs, and tags. According to the developer, the app can get smarter over time by learning from your "habits" (I assume it means abbreviation use and choice of results in search). There are other nice touches worth mentioning. There's a Private URL feature to automatically make URLs that match criteria specified in the Preferences private in your Pinboard account; when adding a new bookmark, Shiori can get the active webpage URL and title from the browser (Safari, Chrome, and Firefox are supported) and provide a list of recommended tags (a feature of the Pinboard API). Shiori is simple, elegant, and fast. Get it here for free.